My mother nicknamed me Mr. Mischievous. Most of the sneaky things I did as a child I do not recall. However, I do remember frequently cutting school when I was in the second grade. No one stopped me from walking out of the schoolyard during recess. The backyards, tree branches, and garage rooftops of my Queens, New York, neighborhood attracted me more than the 'three R's' did. This was to be expected from a child who was allowed to roam freely at his family's old farm in St. Lawrence County, New York, every summer since he could walk. I did not know it then, but the experiences of my teen years were building a compass in my mind that would guide me through life's challenges for a couple of decades. I was bussed to a predominantly Jewish neighborhood for school after the second grade. Academic success was lauded in this new setting. I progressed to honor student status, attended a few Bat Mitzvahs, and became the first African American president of the student body at JHS 194. The day I was elected I told my father that my generation would elect the first African American President of the United States. It was prophetic. Earning my own money became the theme during those impressionable years. A failed paper route at age 12 (Show me an adolescent who likes to wake up early...) got my employment years underway. Working for $35 per week on a farm near my family's second home at the age of 15 made me feel like a grown up breadwinner. Amish farms dotted the St. Lawrence County landscape in the 1980's, and they remain prevalent today. Earning $5 an hour working for my father in the Garment District of Manhattan the next summer was akin to striking it rich. My skipping school adventures ended when I was sent to an unfamiliar neighborhood for third grade. After two years in the third grade, my learning wings grew and I flew through the remaining grades. My plan to run away to Hollywood to become a Hip Hop star during tenth grade was sidelined by the start of my participation on the Thomas Edison HS track team. Camaraderie and competition with what has proven to be the lifelong friends I made kept me grounded. Graduation came midway through my senior year with my growing anticipation for Marine Corps boot camp in March of 1988. Well, the Marines found out about my history of recurring migraines and would not accept me. Reluctantly, college was my best option in the summer of 1988. Loved it! The freedom of choice and flexibility of scheduling at York College (CUNY) suited me fine. Before long, graduate school at Springfield College in Massachusetts was behind me, and I began teaching in a suburb of NYC in September of 1993. Teaching and coaching found me bouncing from school to school until landing a quasi-administrative job in my third school district. Back to school I went to earn an advanced degree in school administration from Mercy College in 2000. Now began my movement from job to job as a school administrator. 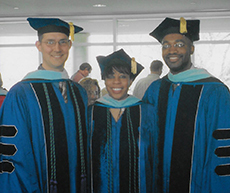 Seeking to advance to the top of my field found me completing my doctorate in education at Seton Hall University in 2006. Never tired of learning, I have studied Spanish in Guatemala and Panama, became a certified teacher of English to speakers of other languages at Columbia University, and plan even more mind expanding endeavors. One of my York College buddies is a terrific and prolific writer. Reading his works confirmed in me that I could never do what he does. That all changed when his edits of my letters and essays were returned with fewer and fewer corrections and/or suggestions. Additionally, I read a New York Times bestselling book that so disappointed me with the low quality of its writing that I knew I could deliver better material. Hence, my thoughts began to spill onto pages. Traveling for me is the equivalent of leaving a lie to discover the truth. It is impossible to deny what is experienced with the five senses. I prefer the great outdoors and world heritage sites; however, people leave the most lasting impressions. Reading and listening to books, watching dramas and thrillers on stage and screen, documentaries, fine dining, fine art, roller coasters, meditating, soaking in a jacuzzi, and relaxing in an Adirondack chair while sipping an iced tea bring me pleasure. For a time, I was a foster/adoptive parent. Nothing can make someone feel more inadequate than parenting. Children International: Through them I sponsor children in the Dominican Republic, Guatemala, and Ecuador. My visits with the children restore my hopes for a better world. The Fresh Air Fund: I have volunteered much time with them in the past, but it is my last will and testament that will benefit them in the future.